Harpooned is a free game for Windows and Mac. It is a Cetacean Research Simulator, where you play the role of a Japanese scientist performing research on whales around Antarctica. You can read an account of the opening night here. 1Up features Harpooned in its Best Free Games list. Read the rest of their list here. 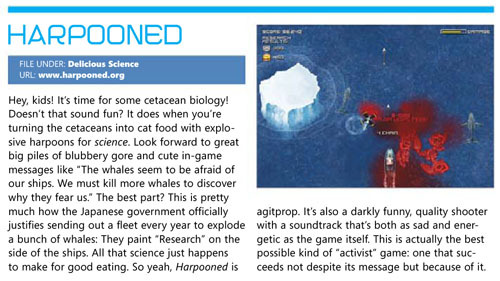 Harpooned is reviewed in the latest issue of Retro Gamer CD magazine. Harpooned – 2009 update now available! Harpooned has been updated with lots of new features and is now available for the Mac as well as Windows. Harpooned 2009 update from Conor O’Kane on Vimeo.